Discover some of the world’s greatest architectural works of art at your fingertips in and around Russia’s capital. 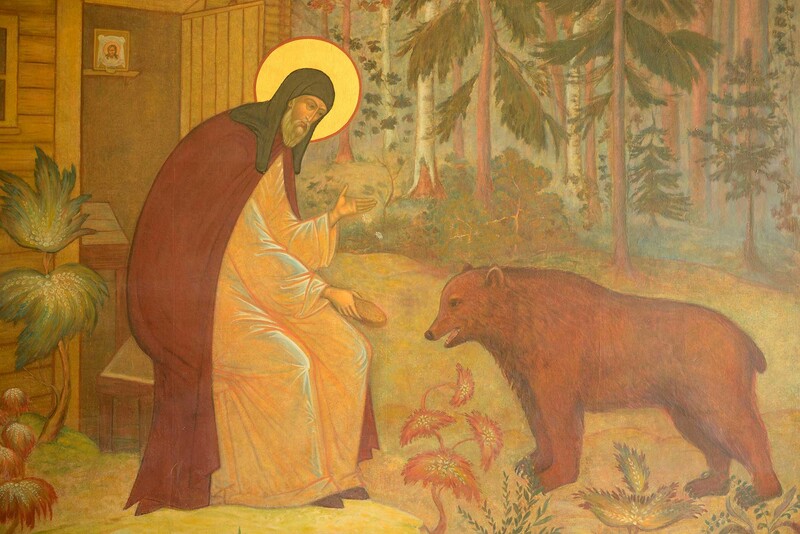 These sites form the backbone of Russia’s historical, religious and cultural heritage. In this series RBTH examines the natural and cultural wonders that make up Russia’s 26 UNESCO heritage sites from east to west. UNESCO’s World Heritage Site program seeks to preserve natural and cultural landmarks that are deemed of global significance. If any site on UNESCO’s Russia list needs no introduction, it is this one. Russia’s most famous address does not disappoint with its majestic gates, towering domes, ornate symbols and fabled clocktower. The center of Russian power from the 13th century until the founding of St. Petersburg in the early 1700s, the Kremlin was a major religious center and the residence of Russia’s Great Prince. Most structures were built by a team of foreign and domestic architects from the 14 th to the 17 th centuries and were meant to be imposing; they remain so today. This site is densely packed with architectural, historic and religious wonders, that it scarcely could be visited in one day, although many try. 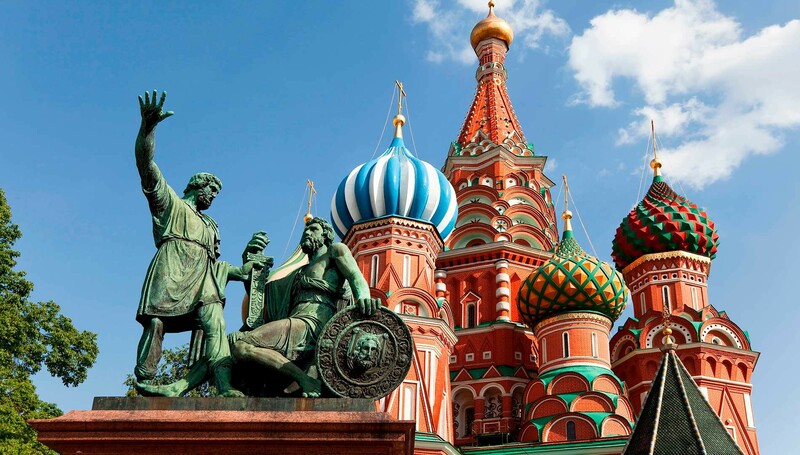 St. Basil’s Cathedral, which dominates Red Square, is perhaps Russia’s most recognizable symbol with its swirling onion domes reaching into the sky; they were intended to resemble a bonfire. At one time Moscow’s tallest building, Ivan the Terrible ordered its construction in the mid 1500s to commemorate military victories over Astrakhan and Kazan. Red Square separates the buildings of the Kremlin from the rest of the city. 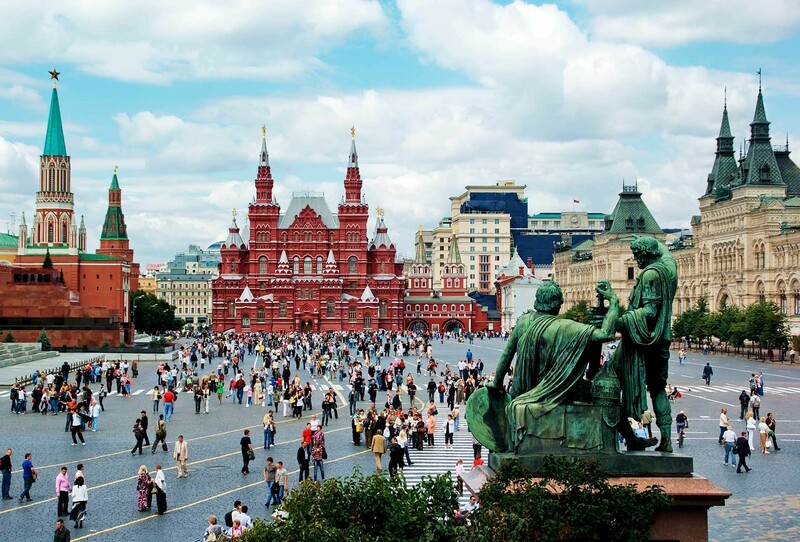 It is considered Moscow’s main square as all of the city’s old major roads originate here. The Church of the Annunciation was built in the late 15th century and was intended to be a personal chapel for the tsar. It was built by a Russian architectural team and therefore varies in style from the Kremlin’s other two major churches, which were designed by Italians. It features facades of white limestone and nine golden domes. 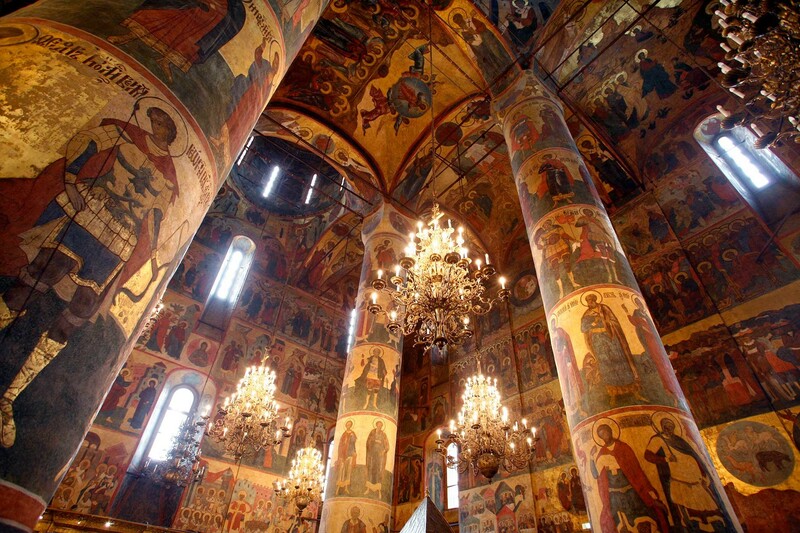 The Cathedral of the Dormition, consecrated in 1479, was the coronation site for Russian tsars from 1547 until 1896. Many of the major religious leaders of the Orthodox Church are buried here. 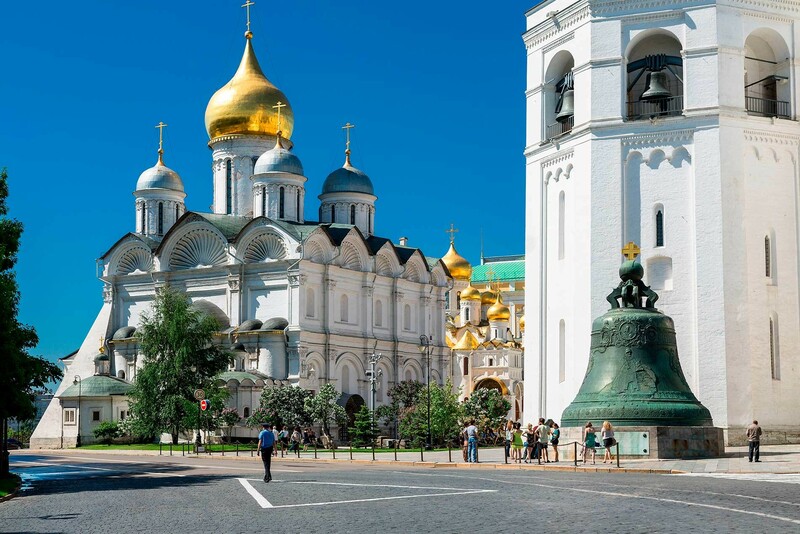 The Cathedral of the Archangel was completed in 1508 and was the site of military victory celebrations and where Russian tsars and grand princes were buried until Peter the Great. Among the numerous other historic sites here are the Ivan the Great Bell Tower, considered Moscow’s exact center; the Great Palace of the Kremlin, which features the Church of the Nativity of the Virgin and the Terem Palace; and the Armoury and Arsenal. 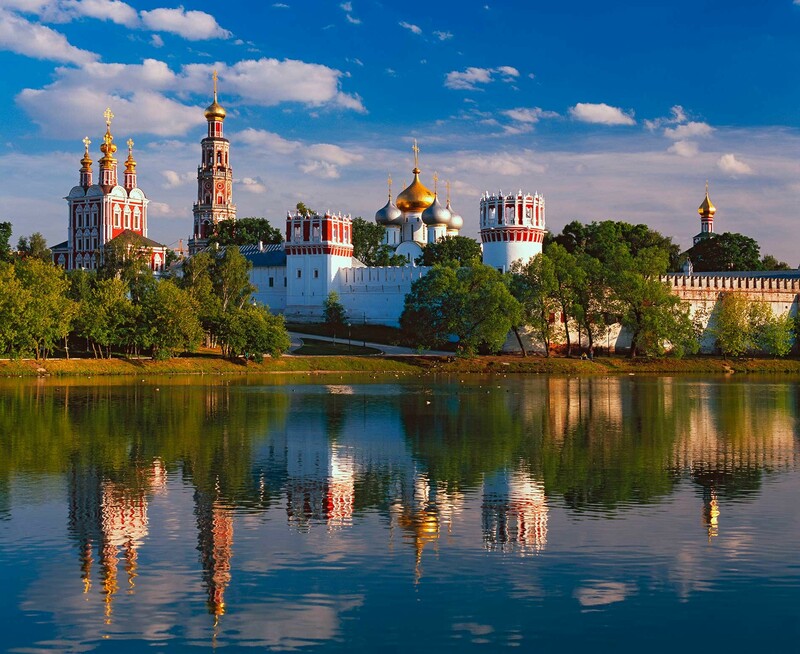 Located approximately 70 kilometers northeast of Moscow on the road to Yaroslavl, Sergiev Posad garnered inclusion on UNESCO’s list for being a first-rate example of a working monastery. The main church here, the Cathedral of the Assumption, is the final resting place of Boris Godunov, the first non-Rurikid tsar, whose death in 1605 ushered in the Time of Troubles, a period of great national chaos. Also located here is “The Trinity,” perhaps Andrei Rublev’s best-known icon and the standard bearer for iconography for the entire Orthodox faith. Originally founded in the 1330s, the monastery’s current structures were built from the 15th to the 18th centuries and contain many military characteristics typical of the period in which it was built. Sergiev Posad became an integral part of Moscow’s regional defense system with the addition of fortifications that were installed in the mid-1500s. This church was built on a tsarist estate near Moscow in 1532 (very much within Moscow’s borders today) to commemorate the birth of the prince that would come to be known as Ivan the Terrible. 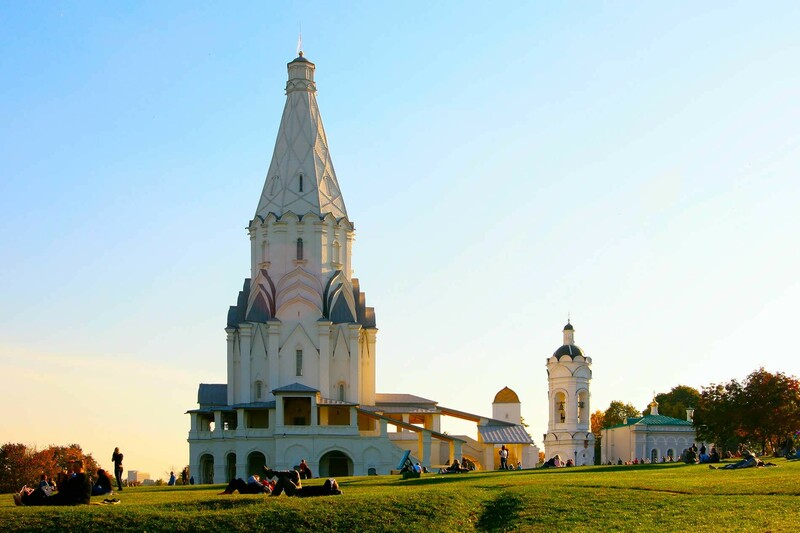 It may command the attention of the casual visitor today, but was revolutionary at the time: this was the first tent-roofed ecclesiastical structure in stone built in Russia and it had an enormous impact on Orthodox architecture going forward, becoming something akin to a national style. This church, with its one dome, represented an enormous break with the standard church style of having five domes on four pillars. The walls are several meters thick, but the tall ceilings give the cathedral an air of spaciousness. 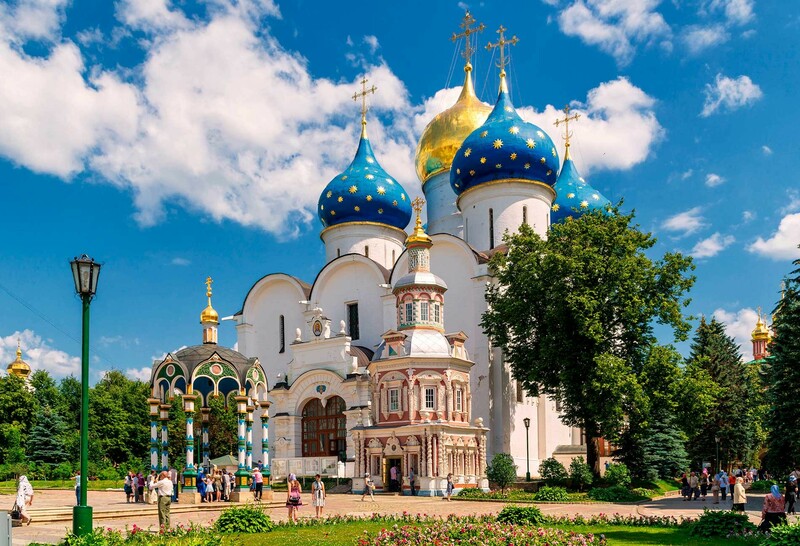 Built in the Moscow Baroque style in the 16th and 17th centuries in southwestern Moscow, it was one monastery in a line of similar properties strategically positioned as bulwarks to aide in Moscow’s defense from foreign incursions. Founded in the 1520s by Grand Duke Vasily III to celebrate Smolensk’s return to the Russian fold, the interiors of the convent are noted for their ornate frescoes, considered among the finest in the city. There are many churches here although the five-domed Smolensky Cathedral, built in 1524-1525, is the most famous. Its 72-meter bell tower was the tallest structure in 18th-century Moscow. The convent played a role in several of Leo Tolstoy’s major works and is also notable for playing a role in a major Napoleonic fiasco during the War of 1812: he tried, but failed to blow the convent up. Up until 1917 the premises also served as an alternative tsarist residence and were used by the women of the tsar’s family; many of their close relations are buried in its cemetery. Today the cemetery is the final resting place for many notable figures from Russian history including Anton Chekhov, Lyubov Orlova, Sergei Eisenstein, Nikita Krushchev, Zoya Kosmodemyanskaya, Mikhail Bulgakov, Yuri Nikulin and Boris Yeltsin.